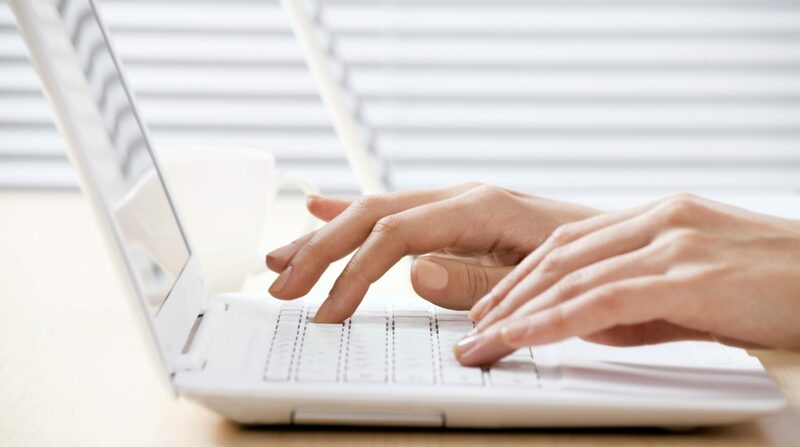 In the course German: Civil Registration Records, the first thing you will learn is what types of civil records the German-speaking countries generate and where you can find them. Finding them is not as easy as it sounds. Every local jurisdiction has its own Standesamt (civil registry office). 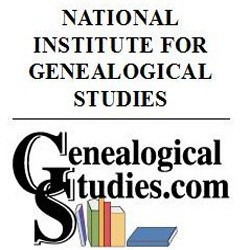 You have to know exactly where your ancestor lived to find his/her records. Since I had already taken the German: Locating Places in Germany course this was familiar territory. German gazetteers like Meyers Orts- und Verkehrs-Lexikon des Deutschen Reichs will help you find the correct jurisdiction. 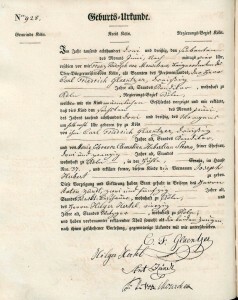 Civil registration started early on, as early as 1792 in some places, so this is a great source for birth , marriage, and death certificates (Geburtsurkunden, Heiratsurkunden und Sterbeurkunden). In the second module of this course you learn what sort of information you can expect to find in these records. German civil records are fairly uniform across the different jurisdictions and contain a lot of genealogical data. Many Standesamts used typeset, fill-in-the blank forms which usually makes them easier to read than church records of the same time period. Many of Germany’s civil records have been microfilmed by the Family History Library (FHL). The FHL’s FamilySearch website is starting to upload some of these microfilms online as they are being digitized (check the Records collection for Germany). Don’t make the mistake of thinking that what you see on FamilySearch is all there is. You must also check the FamilySearch Catalog. You can order microfilms and they will be sent to the Family History Center nearest you where you can view them. With my own family I have been very lucky. The Köln Archives has put digital images of their holdings online. They aren’t complete yet but this has been a goldmine for me because my family has been in the Köln area since the early 1700s. The records are not indexed as a whole but each individual book is indexed so that helps. The biggest problem is the one I mentioned at the beginning of this post; there are Standesamts for every local jurisdiction. Köln is a big city and it is divided up into many districts, each with its own Standesamt. One really nifty thing you will see on German civil records that you won’t see on American ones is a chain of documents. For example, if you find a death certificate for someone, the Standesamt, year and page number for the person’s birth certificate will also be recorded. You can then use this information to find the actual birth certificate. You will also see these same links to births on marriage records. 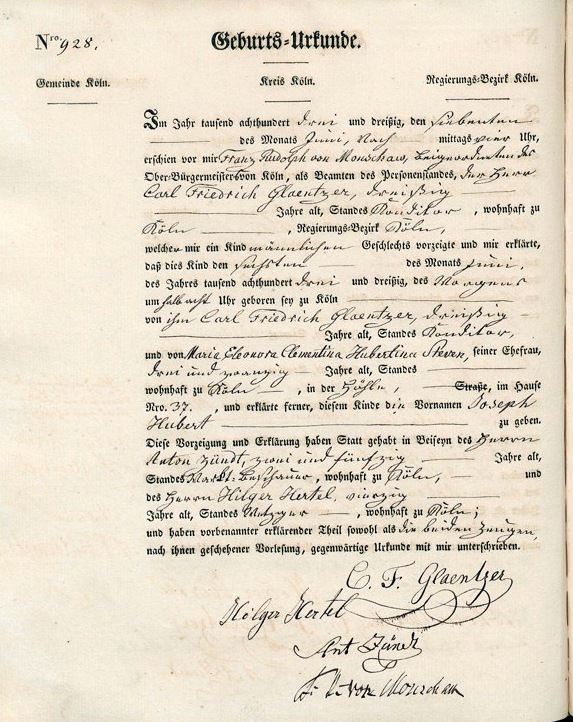 If you are lucky enough to have a family’s Stammbuch, the Standesamt, year and page number for all of the births, marriages and deaths will be recorded. A Stammbuch is a booklet of vital events that the family keeps. The entries are stamped by the local Standesamt. Module 4 is very important because you learn about Germany’s privacy laws. These laws are very strict and they are different than what you might be used to. There are three different laws that govern civil registration records and you need to understand them all because it will save you some frustration. Getting to know your cousins in Germany will help you obtain documents that you would otherwise not be entitled to. This is only a problem for more contemporary records. The older records are accessible to anyone.